Our Brecksville law office is at 7650 Chippewa Road, Suite 214, Brecksville, Ohio 44141, and can be reached at (440) 792-6777 or brecksville@valente-law.com. 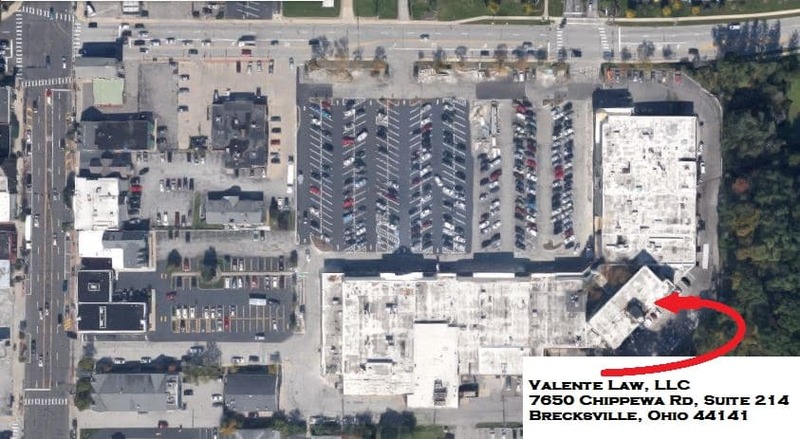 Valente Law, LLC’s Brecksville lawyer office is located in the Brecksville Town Center Building. Brecksville, Ohio gives us a convenient location to provide estate planning, probate, business, real estate and more legal services. Valente Law’s original office was established in early 2015 in Hudson, Ohio. Brecksville is our second office. We are conveniently located in the Brecksville Town Center. There is ample parking available in the main lot in the plaza. Our Brecksville, Ohio law office is wheelchair accessible. We chose Brecksville, Ohio as the first area of expansion for our firm, because of the great people and businesses in the area. Brecksville has held a population of about 13,500 for the last several years. Residents of Brecksville have a median household income in excess of $100,000. Brecksville is home to many small businesses and a growing economy. We are pleased to be in position to provide legal services to the great people and businesses in the area. We provide estate planning services from our Brecksville office. Our estate planning practice involves using a mix of trusts, wills, power of attorney authorizations, health care planning documents, and more. Estate planning is important for all adults. It becomes increasingly more important when you have children, get married, acquire assets. We focus on probate avoidance, maximizing efficiency, reducing costs and carrying out the exact intentions. Our Brecksville lawyer commonly advises using a revocable living trust as the foundation for your estate plan. However, every client is unique and every estate plan is specifically crafted to fit that specific client’s situation. Our Brecksville lawyer provides estate planning services to clients in all stages of life. Young individuals and families, and pretty much all adults, should have the basics. This includes a will, financial power of attorney, and health care planning documents. Individuals and families that have more complex situations should consider adding a revocable living trust to their estate plan. Complexities could include prior marriages, significant assets, likelihood of being sued, and many other factors. It is important to review your unique goals and concerns to design your estate plan. For more information on our estate planning practice and general concepts, check out our main estate planning page. Probate is another area of law we offer for clients who may have recently lost a love one. We handle decedent estates for Brecksville and all surrounding areas. Our Probate lawyer regularly practice in the Cuyahoga County Probate Court, Summit County Probate Court, Medina County Probate Court, and the surrounding counties. Probate involves the process of making sure a decedent’s assets are used to pay his debts and then distributed to his heirs. If you want more details, check out our main page on our probate lawyer services. Probate is a complicated and technical process and we are happy to assist in the process. We provide real estate legal services from our Brecksville office. Our Brecksville lawyer services for real estate include drafting deeds, resolving real estate disputes, handling evictions for landlords and tenants, drafting purchase and sale agreements and working with developers. We help co-owners resolve disputes and can file actions for partitions to split the property or sell the property. It is becoming more and more common for homeowners to sell their homes for sale by owner, and we can help facilitate this process. For more information on the real estate attorney services we offer at our Brecksville law firm, check out our main real estate law page. Brecksville has many great small businesses and a growing retail and commercial presence. Valente Law offers corporate counsel and business law services from its Brecksville law office. We assist startup businesses with forming their company by registering it with the state of Ohio. Registration is usually done by filing Articles of Organization or Articles of Incorporation. We work closely with businesses and provide contract, negotiation, litigation, collection, and other business legal services. The Brecksville Chamber of Commerce has some helpful resources and for more information on Valente Law’s business law services, check out our main business law page. Brecksville is a city in Cuyahoga County, and the Cuyahoga County Common Pleas Court, including its Probate Court division have jurisdiction over Brecksville. Brecksville businesses must file and register their business with the Ohio Secretary of State. Deeds for all Brecksville real estate are recorded and publicly available at the Cuyahoga County Recorder’s office. Brecksville’s official government website managed by the Brecksville City Hall has many resources. Garfield Heights Municipal Court has jurisdiction over municipal court cases for Brecksville. 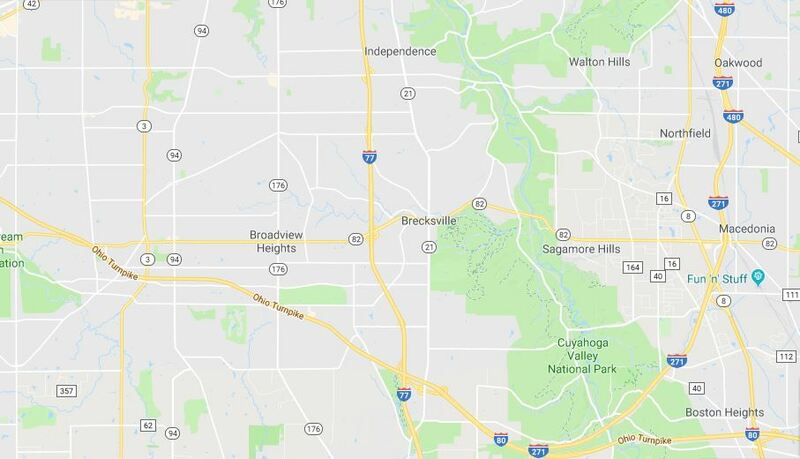 Brecksville, Cuyahoga Heights, Garfield Heights, Independence, Maple Heights, Metro Parks, Newburgh Heights, Valley View and Walton Hills all fall under the jurisdiction of the Garfield Heights Municipal Court. Garfield Heights Municipal Court has authority over misdemeanors and limited felony cases, traffic cases, small civil lawsuits where the amount in controversy is under $15,000.00. It also sees Small Claims cases where the maximum amount in controversy is $3,000.00. Brecksville has good highway access to the greater Akron and Cleveland Areas, with multiple highways and main roads.